We get so busy sometimes that our lives seem less like collections of individual moments and more like a chaotic blur. But when we slow down, we can see our moments strung like beads, one after the other. Most of them are forgettable, routine. Many of them are memorable for one reason or another. And a few are so wonderful, so awful, so unexpected, so enlightening, that they are life-changing. But these essays blow that formula out of the water. 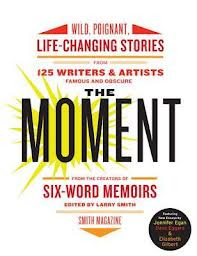 The titular moments do include encounters with inspirational people—teachers, journalists, John Updike, Allen Ginsberg, Oprah. But they also include a drunk crash on an ATV; the fear of flying; parenting of biological, adopted, and foster children; racism; Nunsense; addiction; strippers; a suitcase full of rodents; a moth in the car…a full 125 of them, each unique. At first, I thought, well, many of these people are writers, but what do their big moments—sometimes hilarious, often quite touching—really have to do with writing? But I as I read more, I realized the connection was that every moment described in this book was worth writing about. Even if it was not about writing. And that is what writers do. We write about lives, real or imagined. We write about the moments that change us for better or worse. We pay attention, we collect these little sparkling beads and try to string them together in a way that makes sense, that has meaning, that might help someone else along the way. I have never been ambushed by the Taliban (thankfully) or had to take down the license plate of a drive-by shooter (again, thankfully). But I like to think that the special moments in my life have made me, or will someday make me, a better writer. Have you had a moment change your life? Did it inspire your writing? I find that capturing the moment IS the essence of writing. "Show the reader where to look," I tell myself. "Slow down and write the moment, not the event or the decade. The moment." I have lots of moments that surface in my writing -- some from my life and some from my imagination. I'm trying to learn to paint them vividly with words. It seems as though my whole existence is made of moments that changed my life. That has taught me to "go with the flow" and take every moment, good or bad, one step at a time, one day at a time. Needless to say, I'll never run out of things to write about. I'd have to agree with what Patricia said. I'm a rather (ahem) mature woman, so my life is a long string of events, each of which had some sort of impact on me, but I don't know if I can define a single moment that inspired me to write. It seems as though I have ALWAYS wanted to create stories, even before I knew how to write them down on paper. Thank you for visiting my blog and leaving a comment. I don't believe we've had the pleasure of meeting before, so "Howdy!" Write the moment, not the decade. Lynn, that's great. I love it. Susan, thanks for stopping by. I've always wanted to create stories, too, even with out Big Moment moments. Michelle, I hope you like it!